Hey! So here's a quick recipe for using the leftover rice. At my place, as my brother has become health-conscious after coming back from UK, even I've started feeling guilty about consuming unnecessary butter or anything fattening. When my mom makes rice, though we don't want to eat it, especially for dinner, still she serves us. But when we refuse strongly, she somehow agrees. You know how moms are! They never think that their children are full. So when we reject eating rice, for lunch or dinner, or when I don't eat lunch (rice) at home because I'm out and have had out already, the rice is left. If then my mom is fasting or there's just two people who are to have dinner (if my dad is in Pune or somewhere, and my brother is out for the Saturday night celebrations), we make this recipe. I don't know why, but every time the rice is left, I'm too happy. I love schezwan rice. I love it more when I make it. 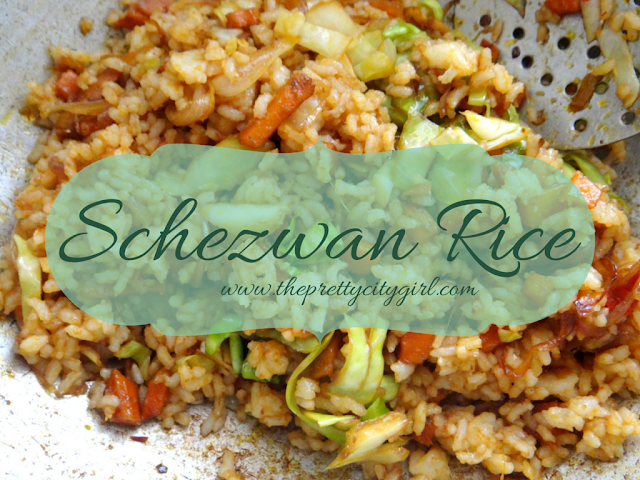 So here's a recipe to turn the boring white rice into delicious schezwan rice. All you need is rice...and some Chinese sauce and other spicy masala (and if you have some vegetables!). In a large vessel, put oil. Let it heat. Add chopped onions. (More preferable are the spring-onions; but as I didn't have them at home, I used onions. If you're gonna make it for dinner, do buy the spring-onions.) Let the onions turn orange-ish brown. Add cabbage leaves. Stir until you feel it's frying. Loosen up the white rice and then put it in vessel. Stir properly. Add more oil, salt, schezwan chutney, and soya sauce, in case you need them. You might need oil after adding the rice, as the whole mixture might get tightened up. You can add chilli flakes and oregano in the rice for a better paste. You can add other Chinese sauces too. Isn't the recipe so easy? What's your recipe of Schezwan Rice?